Duncan and I moved here back in August of 2001. The first Sunday we were official residents of my hometown, we attended Reformed Presbyterian Church of Bowie and we never looked back. It has been such a joy to be a part of this body of believers in Christ and to be under such solid teaching! Soon after we started attending, we began to get to know the other married couple, Megan and Rob, who were about our age and didn't have any children. (I really think they were the only ones in the exact same season of life as us, hence the words the other married couple.) We hung out some, yet we were all quite busy working and/or going to grad school. The summer of 2003, we discovered we were both expecting our first babies at around the same time. It was an exciting time and a blessing to go through that experience with our friends. We got to know each other better as we compared our experiences and discussed what baby gear we were choosing. Megan and I even shared a church-held baby shower. Amelie came along on February 19th and William made his entrance into the world just 13 days later. Megan and I were both able to stay home with our babies and therefore were able to hang out even more. In the Spring of 2006, after Violet was born and when Megan and Rob were expecting their second baby, our neighbors approached us and wondered if we knew of anyone that might be interested in buying their home. I remember the conversation when Duncan wondered aloud if Rob and Megan were considering moving to a bigger home since they were expecting a second child. They hadn't mentioned anything, but we figured we'd throw out the idea to them. One thing lead to another and they became our official next-door neighbors on September 29, 2006. How do I remember the exact date, you ask? I know because Lucy arrived a couple of weeks ahead of schedule, on October 1st--just two days after they moved in! It's been so much fun to have neighbors that were friends first. Freighbors, I call them. We often play outside together, borrow ingredients that we forgot to pick up at the store, or go on Starbucks runs for one another. When I ended up in the hospital the month before Linus was born, their being so close was invaluable. 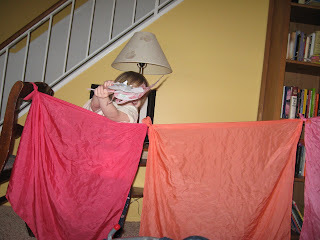 Our children are so comfortable with them and in their home which made a chaotic time more than palatable for the girls. Last week, I had a realization, after Amelie turned 5. For just under two weeks, until William has his birthday, our 5 children are the ages of 5, 4, 3, 2, and 1. I couldn't resist the photo op! So, at Amelie's little birthday party, we snapped this photo. Amelie turned 5 this past Thursday. I can't BELIEVE she's already 5! She is so grown up and so mature in so many ways. An amazing little girl, I tell ya! Here she is just before opening her gifts. I love this picture because she looks very natural. After a dinner of macaroni and cheese (the orange kind) and ham (leftover from Violet's birthday), we had ice cream cone sundaes with our personalized alphabet cookies. Before bedtime, Amelie and Duncan built some stuff with her new Rocky Mountain Ranch Lincoln Log set. My girl LOVES Lincoln Logs which thrills her Daddy! 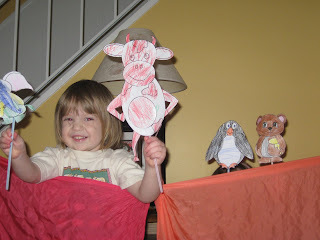 Amelie had a "friend" birthday party when she turned three. It was my idea. She really did not enjoy it as I would have liked her to. Therefore, I've sworn off those types of parties until my kids initiate them. When I asked both girls who they would like to invite over to their birthdays, they both had the identical answer of our neighbors and Bowie Grandma and Grandpa (my parents who are local). This was who they both had last year, as well. I figure that one day they'll want to have a house full of school friends attend their birthday parties, so I'll enjoy the simplicity of their desires for now. The next question asked of the girls was what food they wanted. Amelie really doesn't like dinner. She endures it. However, the girl LOVES all things breakfast. So she jumped on my suggestion of having a breakfast party the Saturday after her birthday. She really wanted baked oatmeal with milk and juice with no water or vitamin C. (Every morning we all get a glass of diluted juice with Vitamin C crystals mixed in for an immunity boost. It's rather sour and even though everyone has gotten used to it, they still prefer plain juice.) We added scrambled eggs, bacon, and bulla-- Swedish coffee rolls made by my mom. All of this was followed by cake and ice cream, of course. Since Amelie has become a fan of Reading Rainbow (yay for LeVar Burton!) she decided on a rainbow cake. Amelie seemed pleased with the result. This is a cute shot with Amelie and her best bud William before present opening. They aren't even two weeks apart, but check out that height difference! I think he's leaning a bit. Amelie is 5 and SUCH a blessing to Duncan and I. I've been surprised lately at how I speak to her in such a grown up way. It's going to quickly! Lord, please help me to appreciate each and every day and all that it holds! I love tulips. Adore them even. Most people that know me well are aware of this. The name of this blog even reflects this fact. So when returning home from a long weekend without my husband (a Valentine's Day weekend, that is) I found twenty tulips on my kitchen table. He knows me. Knows that I love any flowers, but love tulips most of all. I placed them on the kitchen table. Which also happens to be the craft table. And puzzle table. And game table. And (as seen above) lacing card table. It usually holds the remains of drinks or snacks or meals, in case someone get a little bit hungry or a little bit thirsty a little later on. But such is life! Snippets of beauty amidst massive amounts of chaos. My life isn't very orderly. I don't have a regular cleaning or organizing routine. There is always laundry to be done. Crumbs to be swept. Fingerprints to be wiped. But in the middle of all of the chaos are beautiful memories. Peals of laughter. Fits of giggles. As I ponder these truths on the eve of my eldest's fifth birthday, I mourn that it's already gone so quickly. Have I been a momma for five years? Seriously? As I lay in the hospital bed five years ago this night, progressing oh-so-slowly, I never could have known. I never could have know the pain or the joy or the anxiety or the love that is motherhood. I am so thankful for this privilege. This honor. This blessing. These blessings. Of being a mother. Of living this calling. This beautiful calling. ...up pops this amazing website! It's called dltk-kids.com. Perhaps you've seen it. Perhaps I'm jumping in way late in the game. Either way, it's an amazing resource for moms and teachers alike. It's chock full of simple crafts for which you probably have everything on hand (computer paper, scissors, crayons, glue sticks, etc.). Recently, the girls have been into the animals that we color, cut-out, glue together and then tack on a straw for an instant puppet! 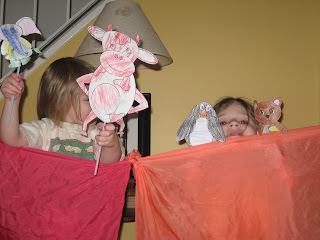 Below is the culminating activity: a puppet show! We've already had hours of enjoyment and we've barely touched the tip of the iceberg that is this marvelous website. 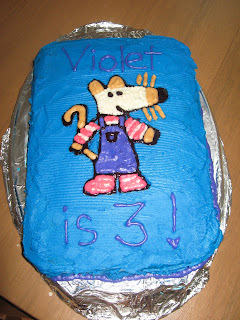 Violet was clued in to her birthday this year. 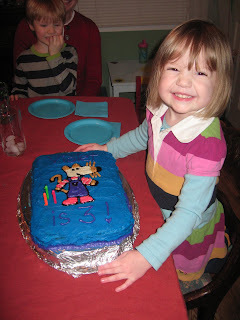 She knew it was coming, knew she was turning three and was excited about it. 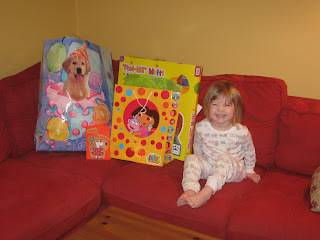 Monday morning, she woke up to her presents. 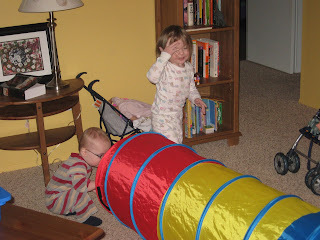 She got a cool tunnel, which everyone enjoys. Mommy and Daddy like how small it folds up. 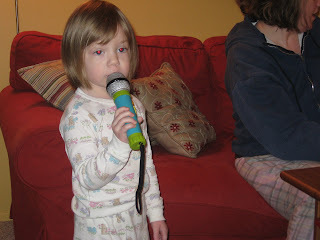 She also got a microphone. A natural, wouldn't you say? 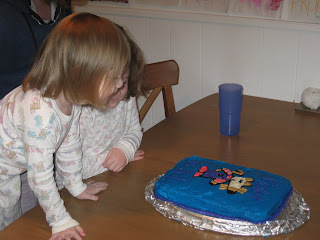 This was her first glimpse of her Maisy cake. She loved it! Here's the cake. I'm thankful that Maisy is a hand-drawn character and is not symmetrical. That took off some of the pressure! Violet chose ham and French fries and strawberries for her birthday dinner. When asked who she'd like to invite, Violet chose our freighbors, William and Lucy (and their parents, of course), and Bowie Grandma and Grandpa. Here's the happy birthday girl after blowing out her candles. Violet continues to light up the room wherever she happens to be. We look forward to this year of three and all that it will hold for our dear Violet-E.